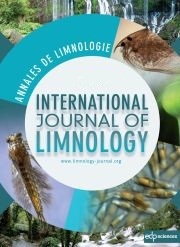 em>Annales de Limnologie - International Journal of Limnologypublishes papers on the ecology of freshwater systems, ranging from studies of aquatic organisms, physical and chemical works which relate to the biological environment, to ecological applications and frameworks for water management directives. The aim of the journal is to promote rapid publication of original researches which lead to conceptual generalisations in the field of Limnology. Purely descriptive studies will be considered only if dealing with a seldom explored field of investigation. Submitted manuscripts are peer-reviewed within 6-8 weeks. Accepted papers are published within 3 months after acceptance by the Editor-in-Chief. The official language of the journal is English.